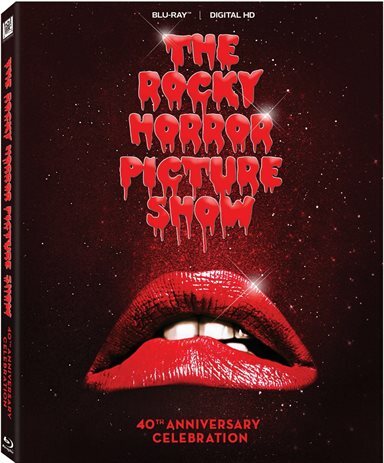 If you are a fan of The Rocky Horror Picture Show, and all it represents, you will want to get this Blu-ray and watch it with a group of friends, plenty of wine and props to carefully throw at your TV screen. "Let's do the time warp again". The Rocky Horror Picture Show turns 40 this year, and 20th Century Fox Home Entertainment is putting out a special edition Blu-ray to celebrate. Fans of Dr. Frank-N-Furter (Tim Curry; Charlie's Angels), Brad (Barry Bostwick; Spin City) and Jane (Susan Sarandon; Bull Durham) will want to own this latest edition of the cult classic. For all the "virgins" out there, The Rocky Horror Picture Show is a far-fetched movie about a young couple that gets stuck on a rainy night and end up at the castle of the Transvestite doctor. Interrupting a celebration, Brad and Janet become entangled in an alternate world that changes them and causes them to explore the more sexual side of themselves. The movie itself is fairly awful and weird, despite a great cast of actors. The real beauty though, is the legions of fans who not only dress up as the characters and act out the scenes, but who yell and throw things at the screen during showings. This interactive method of the movie is unmatched even today, and makes The Rocky Horror Picture Show unique and immensely good fun. This Blu-ray offers lots of special features, including both the UK and US versions of the film. Fans can also download plenty of material live from the Internet. The extras offer viewers the option to watch the movie with subtext that includes all the things fans yell during a live screening and subtitles of the lyrics. One of the nice extras is the casting of the live shadowcast that was part of the 35th anniversary release. The real gem of this movie, though, is the music. Upbeat, memorable and catchy, the songs not only help set the stage, but are also an integral part of the overall experience. The only extra I really didn't enjoy was the outtakes. They were bloopers but they weren't the usual "funny" fair, and therefore, weren't all that interesting. The Blu-ray is surprisingly sharp for a movie that was originally released in 1975. The color is excellent and vibrant and the audio quality is good enough to enjoy the soundtrack as the viewers sing along. If you are a fan of the movie, and all it represents, you will want to get this Blu-ray and watch it with a group of friends, plenty of wine and props to carefully throw at your TV screen. Download Rocky Horror Picture Show: 40th Anniversary from the iTunes Store in Digial HD. For more information about The Rocky Horror Picture Show visit the FlickDirect Movie Database.